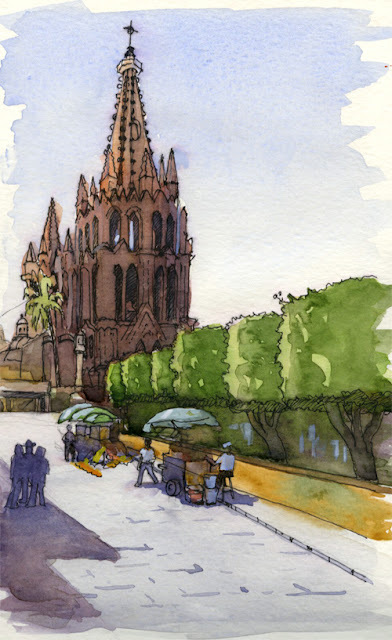 I just got back from a week-long stay with friends in San Miguel de Allende, Mexico. 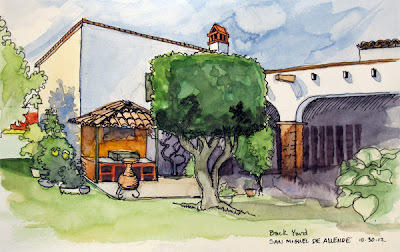 I managed to get in a couple of sketches amid all the activities leading up to the celebration of Dia de los Muertos. I sketched my friends backyard, and two days later sat at an outdoor cafe early in the morning and sketched the Parrocchia, San Miguel's cathedral, before the Jardin got too crowded. Wonderful sketches Al. There's a quality of complexity and depth, yet simplicity. Really nice. I am going to Guanajuato on Saturday. Looking forward to the light and shadows that you captured so well. Very nice sketch of the cathedral. I can picture it perfectly now,even though the last time I was there was 1978. Great color and composition on these, Al.